Rooms Rent Vesuvio i Napoli, Italia: Bestill nå! 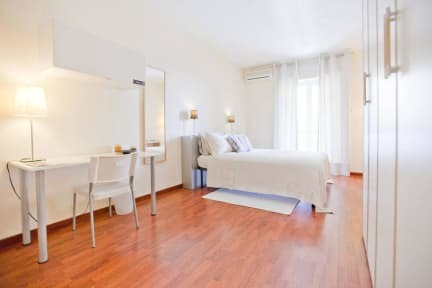 Offering free secure car parking and free Wi-Fi, Rooms Rent Vesuvio Bed & Breakfast is 10 minutes far from Naples Central Station (by Circumvesuviana trains or car), it is in a large private residential complex called Parco Vesuvio , Guarded night and day, with a lot of greenery and sports equipment. Every morning it serves an abundant Italian breakfast and the cleanliness of all rooms. The 3 bedrooms share 2 large bathrooms and 2 of them offer a nice panoramic view of the city. 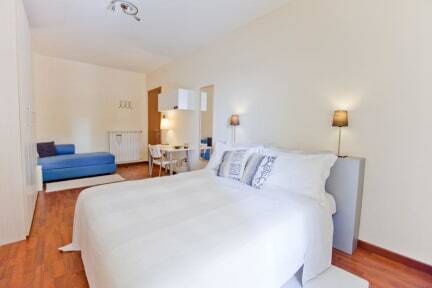 All rooms have air conditioning, parquet floors, a flat-screen TV and a furnished balcony. The Circumvesuviana station 'Vesuvio - De Meis' is just outside the b&b and with it is possible to reach Naples Central Station (5 stops for 10 minutes), Vesuvio, Ercolano Scavi, Pompei Scavi, Amalfi Coast, Vico Equense, Sorrento and many other places. The last train of the circumvesuviana is at 20.00 after that you can take the bus 195 or a taxi for 20 € and not more please be careful, now you know it ;). It is also possible to order a delivery pizza or something else for dinner provided by the nearby restaurant through the owner of the b&b due the restaurant crew does not speak english. In the room you will also find a map of the city (in italian and english), a map of transport and timetables of the Circumvesuviana trains. In the same apartment there is also the owner who will always help you if you will need. 1) An advance equal to the cost of the first night has to be paid immediately after the reservation as a booking guarantee instead the full ammount for non-refundable bookings. If the payment will not made within maximum two hours of booking, the reservation will be canceled. All payments must be received via PayPal on the account gianluigicantoni@libero.it. Please note that the amount advanced by credit card at the time of booking represents only the commission for the service provided by this site and does not go to the property while the payment of the rest will have to be made in cash upon arrival at the property. 2) Check-in should be chosen between 17:00 and 20:00 and communicated to the property as soon as possible. Please do not advise on the same day of arrival. This is very important because the b&b does not have a 24h reception so an appointment should be set up. We would be sure to be here when guests arrive. 3) We'd like to know if you need the transfer service from Airport or Central Station or if you need Parking. Otherwise if you are coming with Public Transport please let us know if you are coming from the Airport or Central Station in order to send you useful information on how to easly reach this place. 4) For the reasons mentioned above, please contact the owner by e-mail as soon as possible after the booking. If this will not happen within 3 days of booking the reservation will be canceled. 5) The air conditioning use will be available at an additional cost of € 5.00 per night.